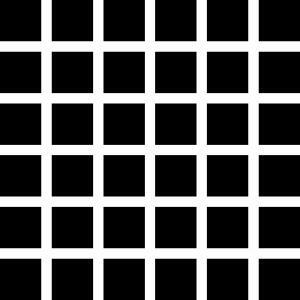 This illusion was first devised in 1870 by Ludimar Hermann, it consists of a series of black squares and interconnecting white lines in a grid formation. When you look at it there appear to be grey dots at the intersections which jump around as you move your eyes over the image. I am a kid and I want to comment about all these images. I learnt the same thing at school. All my classmates were so shocked to see the circles spinning. I am so surpised that the image appears moving to my eyes. I love my eyes. Believe it or not there's no dark patches.